Wondering what next year’s Ferrari-designed A1GP car is going to look like? Well, here’s your first shot at finding out. The location of that first test is a secret – “southern England” is as near as they have come to letting on. But since it’s being built in Sussex… well, you’d have to wonder about Goodwood, wouldn’t you? According to A1GP, the chassis is based on the Ferrari F2004 designed by Ross Brawn, among others, and driven by Michael Schumacher on his way to a world championship. In Ferrari’s hands it won 15 grands prix and its major characteristics were an almost uncanny reliability coupled with amazing speed. British Formula One veteran John Watson will be the first person to get to grips with the A1GP model, including its V8 Ferrari engine, which reportedly produces around 600 bhp. John Travis, A1GP technical director, is overseeing the design, development and production of the car from premises in Bognor Regis, Sussex. Rory Byrne, Ferrari’s design and development consultant and one of the car’s original designers, will be working on the project. Meanwhile the work on the manufacture and supply of the A1GP engine is being overseen by Ferrari’s Jean-Jacques His. The Powered by Ferrari project was first announced on 11 October 2007 when the Italian outfit signed a six-year agreement to manufacture and supply the series with engines and provide consultancy on chassis design from season four onwards. 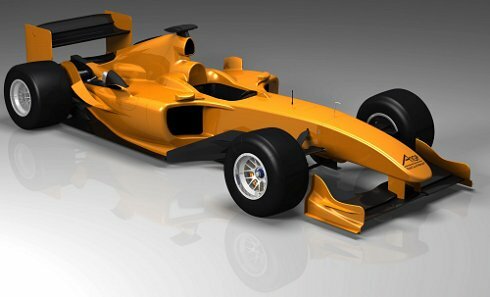 A1GP chairman Tony Teixeira said: “Everyone is very excited about this project and it will be fantastic to see the new car turn a wheel for the first time. ‘We obviously still have a lot of work to do as this is just the first step in what will be an intense development and testing programme, but I am very happy with the progress made so far. ‘We have a small, dedicated group of people in Bognor Regis and are very lucky to be able to use some well known motor racing companies for certain areas of expertise. Categorised under A1GP, tagged under A1GP, Ferrari F2004, Michael Schumacher, Rory Byrne, Ross Brawn, Tony Teixeira.